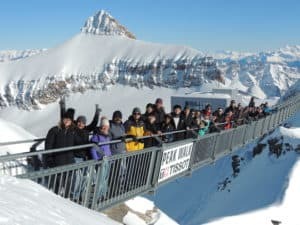 Last week saw the 11th Annual Winter School on Quantum Communications take place in the alpine resort of Les Diablerets. This year’s event, entitled “Quantum Cybersecurity in the Real World” was very busy. We had a full house, which means that, unfortunately, we even had to turn down a few applicants. The special aspect of the school, the hands-on part, where the students can see, touch and interact with real equipment does not allow to extend the number of students. We were very happy to welcome over 30 delegates, from 12 countries, for six days of quantum learning – with a little leisure time thrown in for good measure. 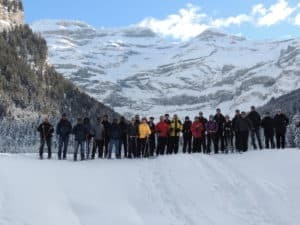 In 2019, Quantum Cybersecurity is no longer a research topic only, but has clearly become a “must” for leading companies worldwide.” The Winter School provided attendees with an opportunity to learn about quantum communications from some of the industry’s best-known researchers and practitioners. We were delighted to welcome quantum experts from around the world, including Charles Bennett and Gilles Brassard, early pioneers of quantum cryptography (BB84 protocol) who offered unique insights into the history of quantum and their vision for the future. The emphasis of the executive track was on quantum security in the real world. This was translated into a number of lecturers from industry. Jason Hart from Gemalto explained that we were still struggling to get cybersecurity easy enough to implement for end-users. Jaya Baloo from KPN showed how the telcos reacted to the ever-expanding number of threats by increased awareness on anything happening to the network. Rouven Floeter from ABB discussed the special threats attached to the security of critical infrastructures. Emily Hodges from Genium4 suggested that better security could only be attained by improving the training and awareness of people. All agreed that the importance of the quantum threat was now becoming a real topic, and that the solution would necessarily imply hybrid systems, with a mixture of current cryptographic solutions, post-quantum algorithms and quantum technologies, such as quantum random number generators and quantum key distribution. The lectures of all our regular guests were also very well received, with lively discussions between lecturers and with the audience. The technical track offered a truly fascinating interplay between practical aspects of quantum technologies, as also exemplified by the hands-on, and much more philosophical aspects, such as the foundation of true randomness, or the meaning of a quantum universe. We were also happy to host Charles Bennett as a last-minute guest speaker, which meant that, this year again, our students could meet the two B’s of BB84, and enjoy a first-hand account of the foundation of quantum cryptography. A generous snow cover, and matching winter weather, also participated to the special atmosphere of the winter school. We thank all our speakers and all our students for their contribution to the great success of this year’s edition. We will most certainly continue the tradition next year. Make sure that you keep posted and reserve early! We’d like to take one last opportunity to thank all the delegates and presenters for making the Winter School 2019 such a success. If you missed out this year, there’s always 2020. Prebook your place by writing at winterschool@idquantique.com.